Starting next week, we are going to be learning a new nursery rhyme every week. This will help develop our language and literacy skills. The first nursery rhyme that we will learn is ‘Jack and Jill’. See below if you would like to practise the nursery rhyme before next week. 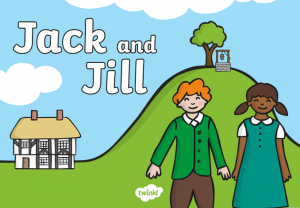 Jack and Jill went up a hill to fetch a pail of water. Up Jack got, and home did trot, as fast as he could caper. He went to bed and bound his head, with vinegar and brown paper.